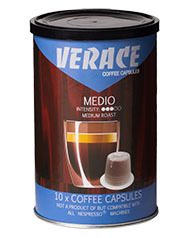 Verace Capsules - 100% Nespresso Compatible with all machine models! 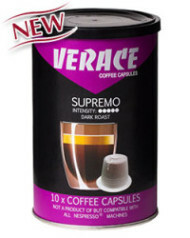 Verace Coffee Capsules - 100% Compatible with all Nespresso® machines! A long roast blend of a series of Arabica coffees and top quality Robusta. An aromatic and intense blend, that leaves no room for light notes. A fully bodied creamy and bitter but well balanced sensation. A good choice for the ones that like cappuccinos or lots of milk with their coffee. Quite strong when enjoyed as an espresso. This long roast coffee blend is of highest quality. A coffee blend made with passion and absolute obsession towards the creation of the ultimate coffee sensation that coffee connoisseurs want. An elegant espresso coffee blend that encapsulates decades of experience in coffee blending and roasting. An aromatic – full body coffee blend. Low in acidity & gentle to the pallet. If you are a coffee drinker that likes coffee neat (with no milk or sugar), chances are you will end up loving Medio like no other. Medio was made for the coffee drinker who enjoys mild palate sensations, often chosen by many Decaf coffee drinkers. An elegant and balanced coffee blend, full of aroma & flavour. Decaffeinated naturally (via cold water blasting), able to still maintain the taste characteristics of a non-decaffeinated coffee to a great degree. Designed for the coffee drinker who enjoys coffee but could do without the caffeine. A refreshing blend of red bush leaves (the botanical name is Aspalathus linearis), collected from different parts of one of the most beautiful places in South Africa – Western Cape. Able to make a very creamy espresso, cappuccino or simply a delicious cup of tea. Ordering your Nespresso compatible coffee capsules directly from the manufacturer, is definitely an exercise worth getting busy with and be sure that you’ve already landed on the right web page. Verace capsules are 100% Nespresso compatible (all the time, every time) and will perfectly function on every single Nespresso (and Nespresso like) machine model. Our company’s prime focus was, is and will always be producing premium quality coffee products, offered in many formats – amongst them coffee capsules. Mostra Di Cafe’s Verace coffee capsules, besides being packed with freshly roasted coffee, come packed with 45 years of experience in the coffee business, something that is given irrelevant to the way we pack the coffee we produce & offer (may it being coffee beans, ground coffee or coffee capsules). We are not in the business of simply offering an alternative or a more affordable coffee capsule to you. We strive in offering you a coffee capsule that – chances are – will end up being thoroughly enjoyed by you. By the end of the day, pure coffee enjoyment is what we want you to end up experiencing in every cup. 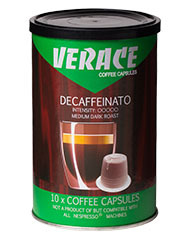 Are Verace capsules compatible with my Nespresso®* machine? Yes. Our coffee capsules fit and function perfectly with all Nespresso®* capsule machines. We strongly advise that you choose Nespresso®* original coffee machines due to their proven functionality, craftsmanship quality, durability and after sale support. Will Verace capsules get stuck into my machine or harm my machine in any way? Our capsules are “push open” capsules. The term “push open” means that the special pins at the back of the machine’s chamber simply push and not pierce the back of the capsule, opening up three small flaps, allowing the water to go through the capsule. This way the machine as well as the capsule itself does not get compromised or damaged in any way. Many coffee capsule manufacturers have produced (and some of them still do) coffee capsules that compromise the beauty and greatness of single serve coffee capsules in many ways. We have spent a great deal of time in researching and choosing the ideal coffee capsule. We have performed extensive testing methods with many capsule models before resulting in this perfect functioning capsule that we offer you today. Is the warranty on my Nespresso®* machine valid even if I use Verace capsules? Be 100% confident that the warranty of your machine does not depend on the capsules you choose to use and that the manufacturer has to honour it. The material Verace capsules are made out of can harm my health in any way? 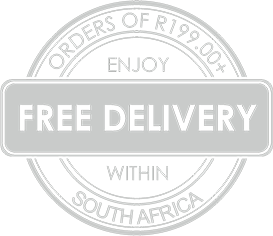 Our capsules are made out of food approved soft plastic, sealed by a thin layer of food approved foil. How fresh is the coffee within the Verace capsule? Our coffee is roasted, grind and packed within the capsules the same day. The air is removed from the capsule prior to sealing. The air is also removed from the composite can the capsules are packed in. How long can I store my capsules? Although each of our capsules as well as the unique packaging we use is completely free of oxygen, we recommend you to use them within 12 months after the manufacturing date. Taking in consideration the nature of the packaging we use (composite can), coffee freshness in this medium could be preserved for a couple of years. Where are your capsules made? 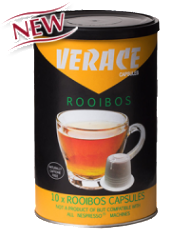 Most of the components used in manufacturing the Verace capsules & packaging as well as the whole manufacturing process (coffee roasting, grinding and packing) is done in our state of the art factory in Johannesburg – South Africa. Would you suggest that I use filtered water instead of tap water with my machine? Yes and this is because the quality of the water plays a major role in the quality of the coffee. Additionally, using filtered water will prolong the time in between the de-scaling sessions you need to do on your machine. How often do I need to de-scale my machine? This depends on the usage of your machine, but we are of the opinion that de-scaling is required after about 500 extractions or once a year. Keep your machine clean (the coffee chamber by running water without a capsule every now and then, do not let the tray fill up from used capsules). Avoid de-scaling your machine using vinegar & water but rather proper de-scaling solution. 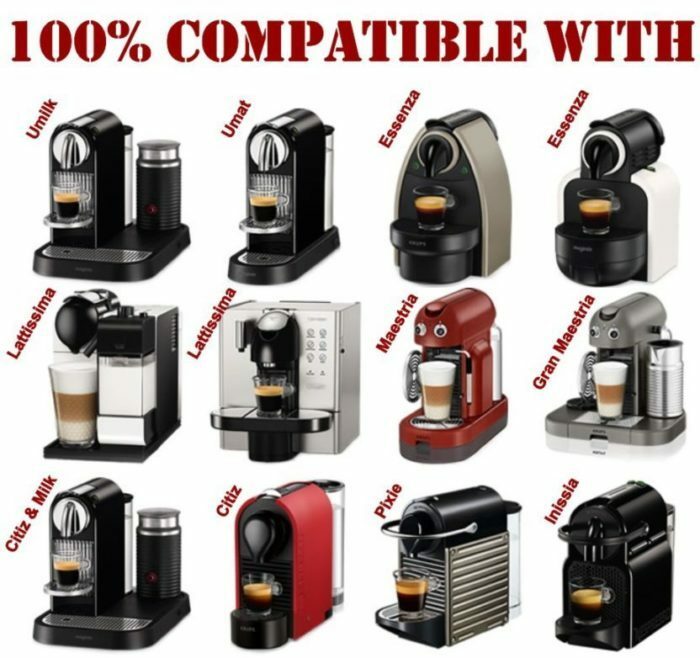 Do you offer Nespresso®* compatible machines? We believe that the machines offered by Nespresso®* are of great quality (with the exception being the U model) and with a proven track record of reliability and functionality. Since our capsules are compatible with all models and since we do not have the need to direct our customer towards machines that only function (or function best) with our capsules, we do not offer any capsule coffee machines. After extensive tests & online research & several comments from users, we concluded that the Nespresso U model can very often be an over-sensitive machine with problematic functionality. This depends on the usage of your machine, but we are of the opinion that de-scaling is required after about 500 extractions. Verace Coffee Capsules are not a product of but 100% compatible with all Nespresso®* machine models! Nespresso®* being the registered trademark of Societe des Produits Nestle S.A.